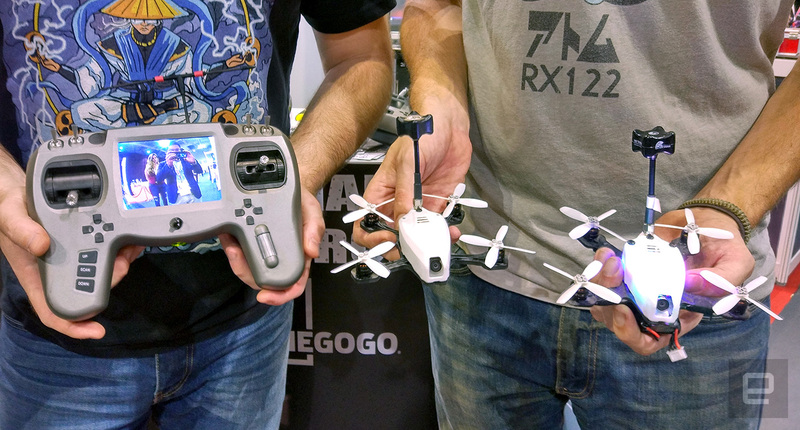 RotorX offers a small, speedy drone with an FPV controller for just $499. Those cool videos from drone races may have tempted you at some point, but where do you start? Traditionally, you'd have to spend at least a couple hundred dollars on components, plus many more on a remote controller and a monitor or goggles. Not to mention the several hours needed for assembling the drone. Too much hassle? Don't worry, because RotorX is now offering its latest micro racing quadcopter, the RX122 Atom V2, either fully assembled or as a quick DIY kit that apparently takes less than 30 minutes -- not five to ten hours like the V1 -- to put together. Better yet, the ready-to-fly version can include a controller with a built-in monitor for a grand total of just $499 for the first 50 backers on Indiegogo, and then $549 for the next 200. The new Atom comes in at just 122mm wide, and thanks to its durable carbon fiber frame plus polycarbonate shell, it only weighs 5 ounces or about 142 grams -- well below the the FAA's 250-gram threshold for mandatory registration. For the same reasons, this tiny drone comes with greater crash resistanance as well as maneuverability than its bigger counterparts. The custom-made brushless motors and propellers allow the Atom to reach speeds of up to 60 mph or 100 km/h, and depending on how hard you push it, its swappable lithium ion battery will last for somewhere between three to ten minutes. Video feed is courtesy of a 600TVL CMOS camera with a 120-degree field of view at the front, and on the receiving end the 480p monitor features 40 channels on 5.8 GHz, with a range of 1.5 miles or about 2.4 km. Should you wish to record video, RotorX will later let you mount a 1080p camera module with a microSD slot. The Atom alone starts from as low as $299 on Indiegogo, if you manage to be one of the first 50 backers and don't mind doing some basic soldering; this will ship in July. Then you have the aforementioned ready-to-fly packages, along with a $849 premium option that also comes with Fat Shark Dominator V3 FPV goggles, but these won't arrive until September, which gives you plenty of time to try other slower drone activities.